How’s that for a clickbait headline? 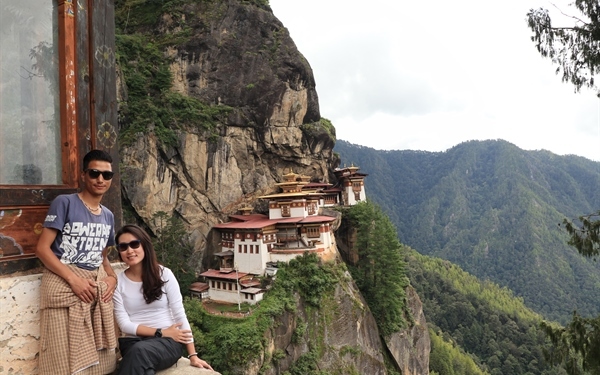 While it may sound sensational and out of the world, every word of it is true: I DID go to Bhutan for a one-week solo trip and I DID end up marrying my Bhutanese tour guide. Ever since word got out about our romance, we’ve had many people commenting that our story was a “fairytale”, a “K-drama”, “almost like a movie”, and that we are both very lucky and are made for each other. While I do agree that we are indeed lucky (as I will highlight reasons why) and yes, possibly made for each other because of how our attitudes, personalities and outlook on life are so similar, somehow I just don’t know where the fascination with our love story begins: Is it because it’s part of the whole narrative of how Bhutan is “mysterious” and “out of this world”, and hence marrying a Bhutanese equates to marrying into an exotic Himalayan country that’s almost unheard of and rarely travelled to? Or is it because people rarely find love overseas and to have that love sustain over long distance, and also culminating into a marriage? The truth is, N and I aren’t the only #OTP (one true pairing) of guide and guest. Since I've been in Bhutan, I've come to know of stories of couples who fell in love while one of them was a guide and the other a tourist. It wasn’t a smooth-sailing time for me in 2017. In fact, it was because it was such a turbulent and spiritually awakening time for me that I knew I had to make a trip somewhere. I was practising meditation, going for dharma classes and doing all sorts of spiritual healing sessions, so a trip to a Buddhist country was a priority. Bhutan had been on my bucket list for almost 10 years. I never could afford a trip here for many years and it was only till recent times that I could finally fork out some money to make this trip. I was contemplating between Nepal, Tibet and Ladakh - all Himalayan countries. Tibet was high on the list but there were many considerations: the amount of time taken to get there, whether it was safe for a lone female traveller, getting a visa into China, etc. Nepal had too many backpackers and Ladakh seemed too remote. I was meant to travel to Bhutan this year instead (2018) with a group of friends from my meditation class, but somehow, there was a strong calling to visit Bhutan in 2017. At that time, something was telling me that I had to visit this year, not the next. So on an impulse, I sent an email to Druk Asia and got them to arrange a one-week cultural trip for me. I also requested for a senior guide and told them I’m a journalist and also a museum guide, so I would prefer someone with a good grasp of cultural knowledge and history. So on the last week of August 2017, I packed my bags and headed to Bhutan, much to the dismay of my mum who was extremely worried - but I’m sure she now realises that her worries were totally uncalled for and there’s possibly a slight relief too that I went on this trip! Was magical. Not because I had fallen in love - that came later - but because I had, for once, experienced a peace I had not known in a long time. That kind of peace is something you’d probably experienced while you were a child: worry-free, no anxiety, calm, simple and seeing the beauty in the tiniest things. When you’re in an environment like that, it’s easy to fall in love. The simple act of holding one’s hand to help one climb up or down while hiking, can make one feel more than what one should. But after you leave that environment, will you still be in love? That’s when it becomes a test. During that one week in Bhutan, I fell into an abyss. Not a deep, dark and cold one. But one filled with warmth, light and feathers for a soft-landing. It was an abyss I couldn’t get out of and it was perturbing for me to return back to my life in Singapore. Everyone who came in contact with me upon my return could tell that I had left my heart and soul in Bhutan, and that I was no longer the same. Bhutan does this to people, that’s why it’s so magical. I call it #TheBhutanEffect. It was no longer the same because I had made a secret wish at Tiger’s Nest. Yes, the iconic cliff-hanging temple that many tourists and pilgrims hike up to. While it is significant in its historical grandeur, to me, it meant something different. You see, I had started to feel certain energy vibrations of a place. Bhutan as a whole was a vibrating spiritual magnet, but Tiger’s Nest had a different sort of vibration. It was an alluring, deep, resonating vibration. It gave me goosebumps and still does when I returned there recently. A few days before our wedding, a friend had - without me knowing - asked N when he knew he had fallen in love with me. He told her it was when he brought me on a hike up to Tiger’s Nest. “Magic happened. And I’m very lucky to have found her,” he told her. While magic was happening to N, on hindsight, it now does feel like some magic was happening to me too, for I had made a secret wish there in two of its temples. Perhaps I had unknowingly fallen in love, because the two secret wishes that I made there have all come true. For anyone who has ever been in a long-distance relationship will know the amount of commitment that’s needed to sustain it. Life for both N and I could have returned to normal after my one-week jaunt. I could have gone back to my city girl life and he would still be doing what he normally does here. But we both couldn’t bear to lose touch with each other. And I couldn’t possibly wait till seven to eight months later to see him again. We had also verbally committed to each other that we will make it work, despite the challenges. So he came to Singapore for the New Year festivities and it was a trip that was similarly etched into his soul. After that, I managed to get a stint as a volunteer trainer in Feb. Again, it was a trip where we had to say our goodbyes again but by then, I had received news that my work permit in Bhutan had been approved and that I will be able to work here for a year. With the help and blessings of a few kind souls, everything had fallen into place: From applying as a volunteer trainer to getting a work permit to not receiving news from other potential employers, all paths and events had led me to Bhutan. They had all led me to N.
When fate and destiny hit you in the face like a ton of bricks, that’s when you truly accept the plot twist you never expected. So our journey begins now. Whether it was a fairytale in the making, a plot twist in our lives, or a wish that came true, we had remained steadfast in making our relationship work. We fought to be together despite all the obstacles in our way and will continue to fight side by side. Because we both believe that love is not giving up on each other when times get tough. Your quiet strength is one of the many qualities I admire and together, I know we can take on the next phase of our lives with courage, grace, kindness and togetherness. Here's to writing a new chapter in our lives. Together. The above has been published with permission from Karen Lim's blog, Life In Bhutan. Karen was born in Australia but raised in Singapore, living here before moving to Bhutan in April, 2018. In a former life, Karen was also the editor of AsiaOne.